Discussion in 'Announcements' started by Marindor, Feb 5, 2019. Soon after the Amuni have left your city, a giant floating island appears above it and stays there as if it would wait for something to happen. At first, your people are very scared and imagine how this island could destroy your city if it would fall down. But then, mysterious beings appear, sent directly from the island. They seem to be friendly and introduce themselves as the Constructs, living beings made by the Elvenar, which they call the High Men, consisting out of all kinds of materials. They see their creators in you and are at least as surprised about you not recognizing them, as you are about their sudden appearance. The Constructs were once developed by the "High Men" to make barren land fertile again - a countermeasure to the rise of the Amuni. 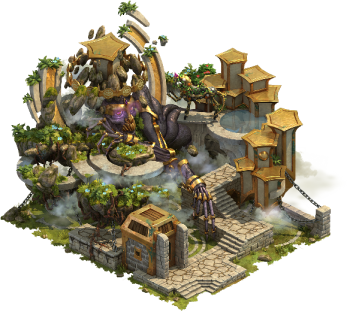 Unfortunately, this last creation wasn't finished completely when the drought arrived at the cities of the High Men. The Constructs were built to be self-sustaining and ever-evolving, just following the orders of the High Men, but otherwise independent. So when the drought took over and the Elvenar were close to extinction, they sent the Constructs to the skies, where they were to safely evolve over time until one day, when their construction would be auto-completed, they would come back down to Unur to start with the task they had been created for. When the Constructs returned to Unur, there was only desert, stretching out as far as they could see. Their creators were nowhere to be found - extinct or disappeared? This question remained unanswered. So the Constructs, sad at heart, but determined to fulfill their destiny, started to bring back life to Unur, silently hoping that once their work was done, their creators would return. But no one ever came. The years passed, Unur regained its fertility step by step, countless new types of flora and fauna surfaced on the land and the Constructs evolved and diversified even further. But none of the mighty races that lived on Unur before the big drought reappeared. So the Constructs started to extend their search more and more, using their most evolved floating versions to even look beyond the borders of Unur, and finally crossed the big ocean to find another continent - the continent you call Elvenar. When they arrived, their sensors detected the desert that started growing out of your town and also life forms that resembled those of the High Men. Could they finally have found their creators? The Constructs will be testing your planning skills once again. 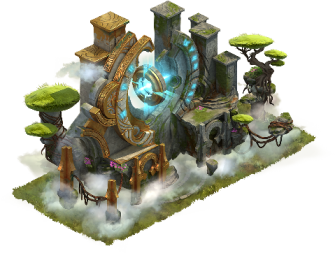 Learn how to use your most developed Constructs to turn Elvenarin into the mystical elements "Elvarium" and "Humanium", which are key to the Elvenar's greatest inventions. In the Constructs Portal, you can queue up productions in any way you like. The Settlement Production buildings will be Set Buildings, so plan strategically go gain the most value out of your available space. And, with the resources being usable for different options, make wise decisions as to what to assign them to. The Constructs will also teach you how to produce three more types of Sentient Goods, namely Silly Soap, Alloy Shrooms and Cosmic Bismuth, which you will need to upgrade their buildings and research technologies. The city grid will not be extended, but you will be able to acquire an extra Expansion through the Research Tree. At the end of the chapter, the Constructs will teach you all about their Ancient Wonders, which will help you both with Sentient Good productions and in playing Tournaments. The Timewarp (pictured above on the left) increases the Sentient Good production boosts and reduces the upgrade time of Tournament provinces. The Simia Sapiens boosts unit productions and reduces the decay of Sentient Goods. The Constructs will offer you more than enough new challenges to keep you busy for the coming months! Good luck planning your city, and of course we're looking forward to hearing your feedback in our Feedback Thread! blackbudahflyb, BunnyRose, mayam and 13 others like this. BunnyRose, Scoobydoo and iDavis like this.